(Nanowerk Spotlight) Today's nanotechnology research often focuses on the search for new materials and techniques, and safety and biomolecular aspects are often postponed for future studies. To avoid erroneous conclusions stemming from endotoxin contamination and sterility issues from commercial starting materials or residual manufacturing components, nanomaterial fabrication for biomedical applications usually requires purification steps. Another problem with some of these compounds is their bio incompatibility and accumulation in the human body which may cause some health complications later on. To overcome these fabrication issues, the use of naturally occurring biological materials – such as RNA or DNA – for drug formulation may become the next big step in nanoparticulate therapy development. "There is a significant need for new therapeutic approaches to combat diseases such as cancer and viral infections," says Bruce A. Shapiro, Ph.D., a Senior Investigator at the Center for Cancer Research,National Cancer Institute (NCI). "Using RNA as a therapeutic modality brings to bear an entirely new approach, which not only allows for the construction of uniform scaffolds for attachment of functional entities, but also permits the use of all the different types of functionalities that are inherent in natural RNAs." New research, led by Shapiro, demonstrates that multifunctional RNA nanoparticles with a nanoring design allow the use of different types of functionalities inherent in natural RNAs. The combinatorial nature of these nanospheres promotes higher detection sensitivity of diseased cells and significant silencing efficiencies of targeted genes in cells and in vivo. The team reported their findings in the September 30, 2014 online edition of Nano Letters ("Multifunctional RNA Nanoparticles"). "Computationally designed RNA and RNA-DNA based nanorings presented in this work have multiple advantages in diagnostics and delivery of functional moieties to diseased cells," Shapiro tells Nanowerk. "These advantages include – but are not limited to – 1) tight control of structural homogeneity, processivity and targeting; 2) programmability; 3) precise control over folding and self-assembly; 4) simple conjugation with different natural nucleic-based functionalities – exemplified by different RNA aptamers, RNA interference triggers (siRNAs), and proteins, to name just a few; 5) thermal and chemical stability; 6) biocompatibility and biodegradability; 7) relatively low immune response; 8) relatively low cost of production; and 9) improved stability of complexes with cationic carriers." He adds that nanoparticles of this type have the ability to incorporate a tremendous amount of versatility, while still maintaining control over stoichiometry, which is extremely important for any potential therapeutic agent. Dr. Kirill Afonin, a Research Fellow at the NCI and first author of the paper, recounts that the concept of nanorings was first introduced through the computational design by Yaroslava Yingling and Bruce Shapiro ("Computational Design of an RNA Hexagonal Nanoring and an RNA Nanotube") and then was further experimentally tested in Luc Jaeger’s laboratory at UCSB. "Our current work shows the versatility of nanoscaffold applications that allows their controlled functionalization with different aptamers, fluorescent dyes, and proteins for biosensing purposes as well as simultaneous delivery of various siRNAs and RNA-DNA hybrids to diseased cells," says Afonin. "Extensive in vitro and in vivo characterizations of the resulting functional RNA nanoparticles were carried out at NCI in collaborations with Drs. Eric Freed’s (NCI-Frederick), Jakob Reiser’s (FDA), Wah Chiu’s (Baylor College of Medicine), Luc Jaeger’s (UCSB), Wade Grabow (SPU) laboratories. Detailed characterization and particularly challenging visualization of functional nanorings with cryo-EM was performed." To demonstrate the combinatorial nature of the scaffolds, the scientists functionalized their nanorings with up to six RNA aptamers (see the top right ring in Figure 1) selected to bind the malachite green (MG) dye and significantly increase its emission, which is otherwise undetectable in aqueous solutions. The team visualized the RNA containing nanorings using single-particle cryo-electron microscopy (cryo-EM). Dr. Alexey Koyfman, a research scientists in the Department of Pharmacology and Toxicology at University of Texas Medical Branch and co-author of the paper, notes that this characterization revealed that siRNA arms do not pointing straight out as expected from the model. After reconstruction, it became apparent that siRNA arms in the nanoring point upward creating a crown shape (Figure 2). 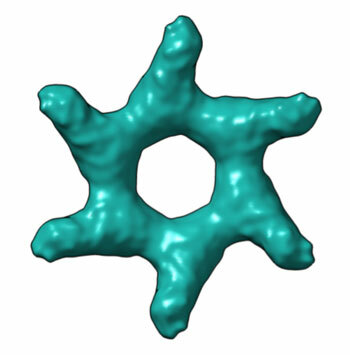 Also, looking from the top, the siRNA arms are positioned in a pinwheel fashion around the ring (Figure 3). To show the feasibility of the nanorings, the team developed a set of two nanorings constructs and tested it with HIV-1 infected cells. "The approach that uses multiples targets within one nanoparticle is very interesting from the HIV-1 point of view," explains Angelica Martins, a researcher working in the HIV Drug Resistance Program at NCI with Dr. Eric Freed. "Since HIV-1 has a high mutational rate, the virus evolves to escape and quickly becomes resistant to the drugs. Therefore, simultaneous targeting of multiple parts of HIV-1 genome can increase the genetic barrier and decrease the chance of the viral escape." She points out that using the nanorings, one would guarantee that all siRNAs will enter the same cell and silence several targets. HIV-1 was a good system to test the nanorings and the multiple targets approach. "However" says Martins, "siRNAs has been shown to be not the best approach as therapeutic measure for HIV-1. Nevertheless, some groups showed that the use of siRNA treatment of virus like filovirus (e.g. Marburg, Ebola) with more acute infection works well as the RNAi therapy. I believe that the multiple target approach should be further tested in these viruses and the results of this combinatorial use of siRNAs should be even better as a therapy." An important next step for the researchers is now to expand the library of the RNA-based nanoscaffolds and to determine potential advantages – or disadvantages – of their application to therapeutic nanotechnology including delivery against specific disease related targets (cancers, viruses, etc). As Shapiro concludes, "combining the different design strategies (described in "In Silico Design and Enzymatic Synthesis of Functional RNA Nanoparticles") and utilizing the various computational approaches that are described in another set of papers ("Computational strategies for the automated design of RNA nanoscale structures from building blocks using NanoTiler", "RNAJunction: a database of RNA junctions and kissing loops for three-dimensional structural analysis and nanodesign", "Multistrand RNA Secondary Structure Prediction and Nanostructure Design Including Pseudoknots", and "Use of RNA structure flexibility data in nanostructure modeling") for example to construct a user-friendly database of RNA nanoscaffolds would greatly simplify the design approach and make the structures readily available for other scientists to use in their research. This ultimately can lead to a combined computational and experimental pipeline to develop such particles."